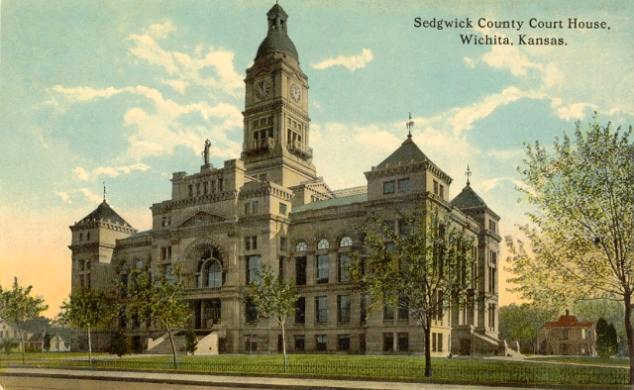 The Wichita Metro Chamber of Commerce urges spending over fiscally sound policies and tax restraint in Sedgwick County. Today the Wichita Metro Chamber of Commerce issued a “key vote” alert. This procedure, used by political groups of all persuasions, alerts elected officials that the Chamber prefers a certain outcome on an issue. Those who vote in harmony with the Chamber are likely to receive support in their next election, while the noncompliant are implicitly threatened with opponents the Chamber will support. While we have not recently had many “key votes” at the local level, the Wichita Metro Chamber would like to alert you that we will be key voting the 2016 Budget. 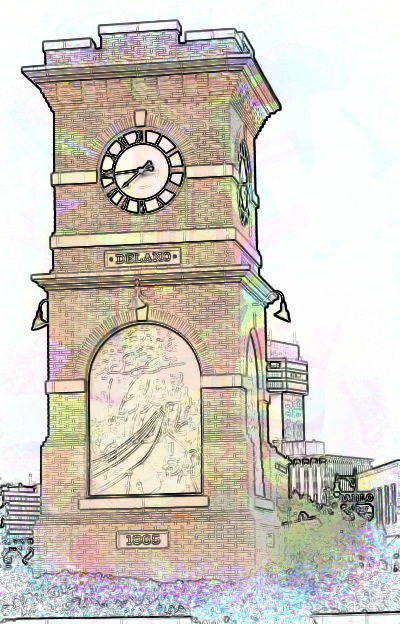 The Chamber would like to encourage the Commission to consider a compromise by leaving the property tax rate as it is currently and reducing the amount of cash-funded roads thus allowing a reallocation of funds for economic development and education, culture and recreation, city partnerships, and health and human services. It’s unclear precisely what the Wichita Chamber is asking commissioners to do. It seems likely the Chamber is asking for support of “Plan C.” That is the plan drafted by commissioners Tim Norton and Dave Unruh, which proposes deferring road maintenance in order to free funds for current spending. That plan sets the county on the course chosen by the city of Wichita some years ago. That is, defer maintenance on streets and other infrastructure to support current spending. That policy lead to declining quality of streets and a large backlog of other maintenance, with a recent report from the city finding that the “cost to bring existing deficient infrastructure up to standards” is an additional $45 to $55 million per year. 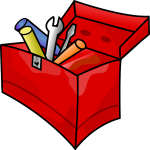 This deferral of maintenance needs is a form of deficit spending. It’s curious that a purportedly conservative organization like the Wichita Chamber of Commerce would support that. Well, it’s not really surprising. 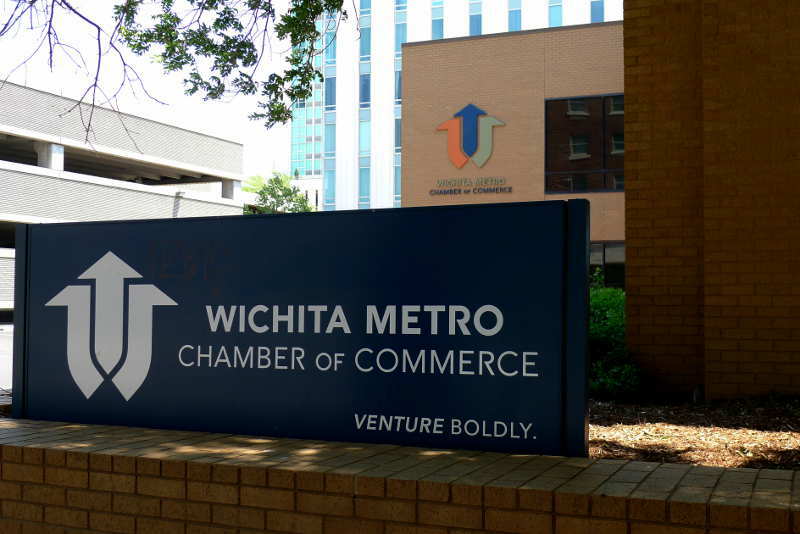 The Wichita Chamber has long advocated for more taxation and spending, taking the lead in promoting the one cent per dollar sales tax proposal in Wichita last year. The Chamber has supported big-spending Republicans over fiscal conservatives for office at several levels. In Wichita, and across the country, local chambers of commerce support crony capitalism instead of pro-growth policies that allow free enterprise and genuine capitalism to flourish. That may be surprising to read. Most people probably think that local chambers of commerce — since their membership is mostly business firms — support pro-growth policies that embrace limited government and free markets. But that’s usually not the case. It’s certainly is not the case in Wichita, where the Chamber supports higher taxes, more government spending, more business welfare, more government planning and control, more cronyism — and less economic freedom. The predictable result is less prosperity, which has been the case in Wichita under the leadership of the Wichita Chamber, its policies, and the politicians and bureaucrats it supports. In the states, chambers have come to believe their primary function is to secure tax financing for sports stadiums, convention centers, high-tech research institutes and transit boondoggles. Some local chambers have reportedly asked local utilities, school administrators and even politicians to join; others have opened membership to arts councils, museums, civic associations and other “tax eater” entities. From Stephen Moore in the article “Tax Chambers” published in The Wall Street Journal February 10, 2007. The complete article is here. That so many speakers at a public hearing were in favor of government spending is not surprising. In a letter to the editor of the Wichita Eagle the writer stated “But apparently few of them felt strongly enough to come to the commission hearing and express their support of budget cuts.” He was referring to the public hearing on Wednesday July 29, when some 50 people spoke, and just three supported cuts. This lopsided ratio is not surprising. It’s an example of the well-known phenomenon of concentrated benefits and dispersed (or diffuse) costs. Explained in this video, it observes that for most government spending programs, the benefits are showered on a few very visible recipients who benefit greatly. There were 47 of these speaking at last week’s public hearing. But the costs of these spending programs are spread across everyone, or at least a large group. For them, the cost is small. In fact, politicians use this argument in favor of their spending programs. Dave Unruh observed that the proposed county property tax cuts amount to savings of $1.37 per year for a $100,000 house. His arithmetic is correct, and so is his understanding of human nature. Most people look at the small cost of any single government spending program and realize it’s not worth much personal effort to save $1.37 (or whatever) per year. Since the costs of each spending program is small for any single person, not many get worked up and take action. That’s why only three of 50 speakers opposed the spending programs. Politicians and beneficiaries of spending programs rely on this imbalance of motives. Not often mentioned is that most of the organizations seeking county funding are charities. Anyone may make contributions directly to them. Some people have testified that they don’t need a cut in taxes, or that they would be willing to be taxed more so that these organizations could have more funding. Perhaps these people don’t realize that it is within their power to make contributions to these charities at any time. It seems we have forgotten that charity is a voluntary act, and that government taxation and spending is not charitable. This is evidence of further drift from a civil society where things like zoos and medical care for the poor are handled on a voluntary and cooperative basis. Instead, we fight. 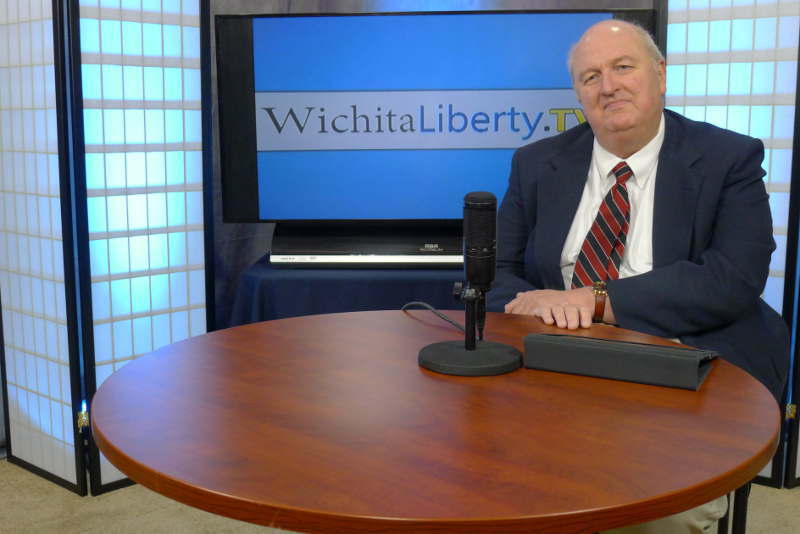 In this episode of WichitaLiberty.TV: Government leaders tell us they want to run government like a business. But does government actually do this, even when accounting for its money? Then, is it best for government to own all the infrastructure? Finally, taxes on Wichita commercial property are high, compared to the rest of the nation. Episode 46, broadcast June 8, 2014. View below, or click here to view at YouTube. 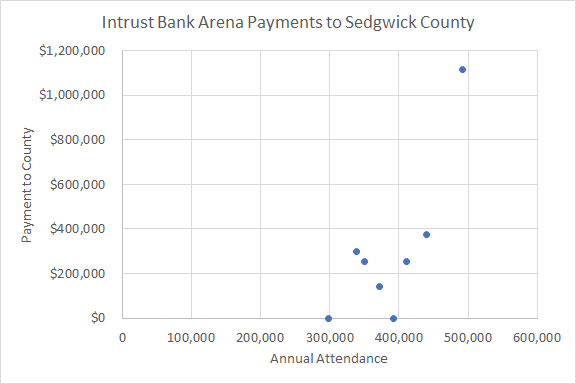 Proper attention given to the depreciation expense of Intrust Bank Arena in downtown Wichita recognizes and accounts for the sacrifices of the people of Sedgwick County and its visitors to pay for the arena. It’s a business-like way of accounting, but a well-hidden secret. Earlier reporting on this topic in the Eagle did not mention depreciation expense, either. This agreement specifies a revenue sharing mechanism between the county and SMG. For 2103, the accounting method used in this agreement produced a profit of $705,678, to be split (not equally) between SMG and the county. The county’s share, as Holman touted, was $255,678. Presumably that’s after deducting the cost of producing an oversize check for the television cameras. 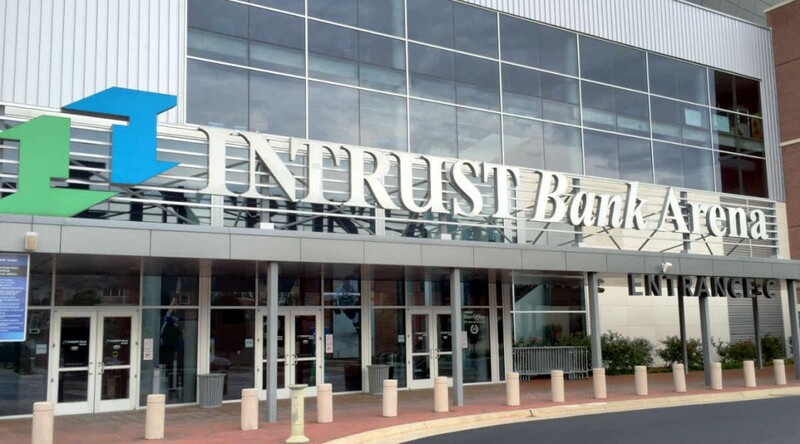 The Arena Fund represents the activity of the INTRUST Bank Arena that opened on January 9, 2010. 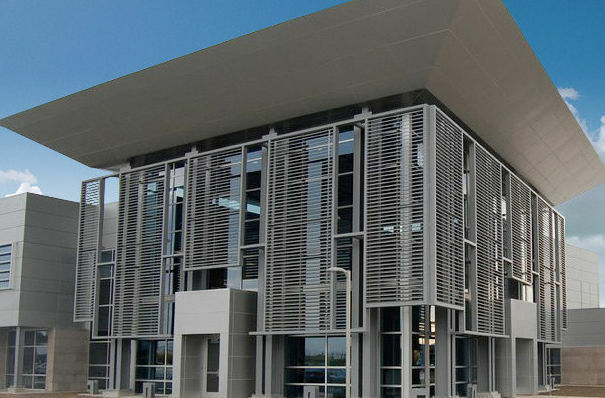 The facility is operated by a private company; the county incurs expenses only for certain capital improvements or major repairs and depreciation, and receives as revenue only a share of profits earned by the operator, if any. 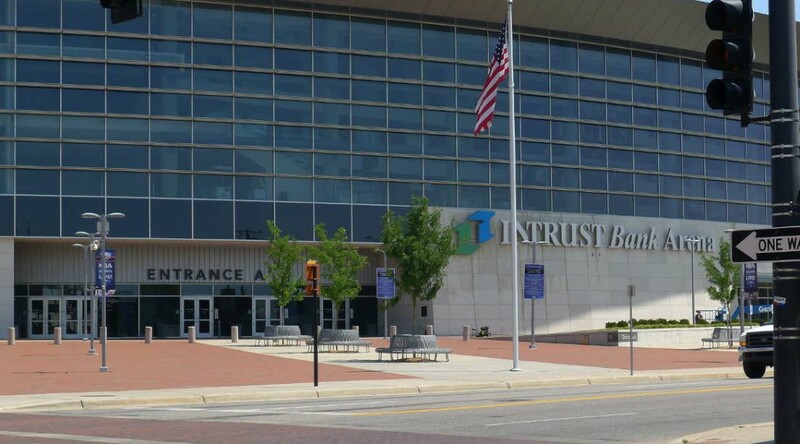 The Arena had an operating loss of $4.7 million. The loss can be attributed to $5.3 million in depreciation expense. 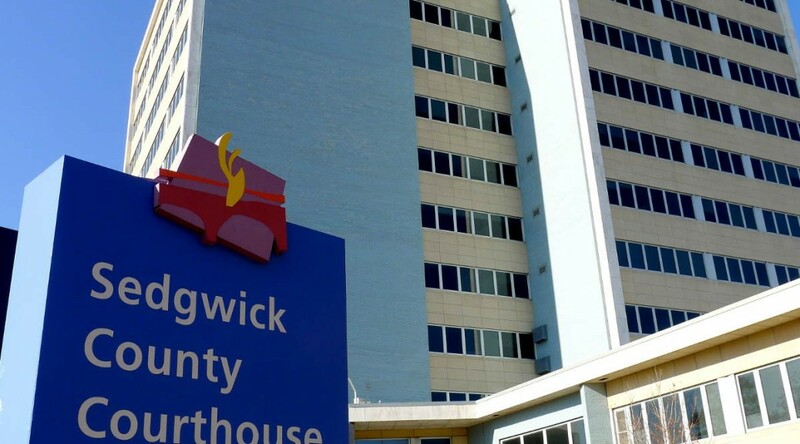 Financial statements in the same document show that $5,295,414 was charged for depreciation in 2013, bringing accumulated depreciation to a total of $21,190,280. Depreciation expense is not something that is paid out in cash. 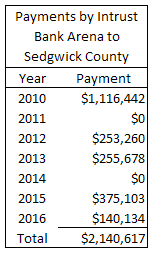 Sedgwick County didn’t write a check for $5,295,414 in depreciation expense. Instead, depreciation accounting provides a way to recognize and account for the cost of long-lived assets over their lifespan. It provides a way to recognize opportunity costs, that is, what could be done with our resources if not spent on the arena. 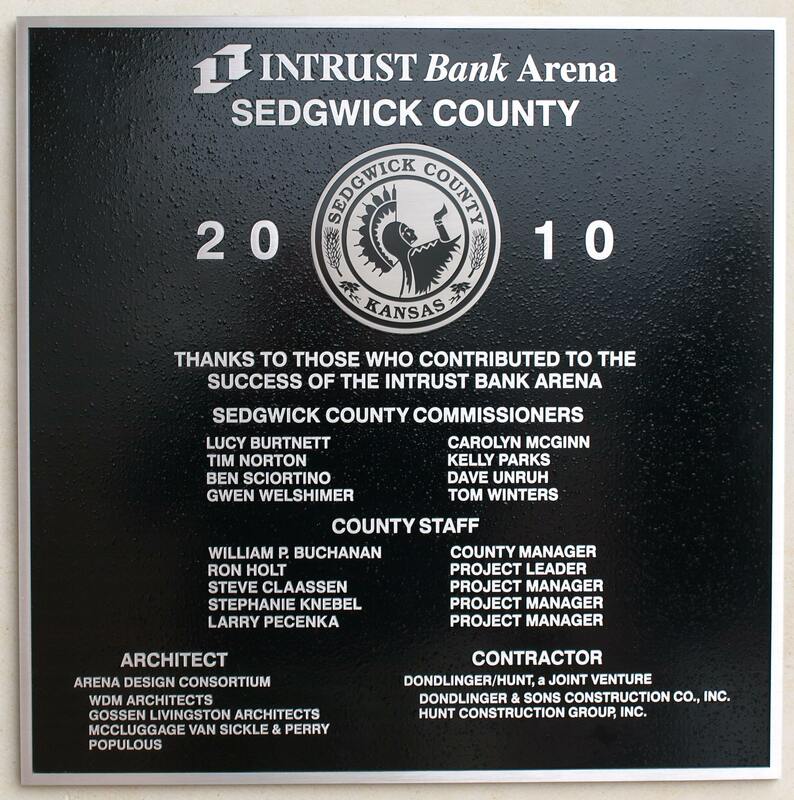 The contention of Unruh and other arena boosters such as the Wichita Eagle editorial board is that the capital investment of $183,625,241 (not including an operating and maintenance reserve) on the arena is merely a historical artifact, something that happened in the past, something that has no bearing today. There is no opportunity cost, according to his view. 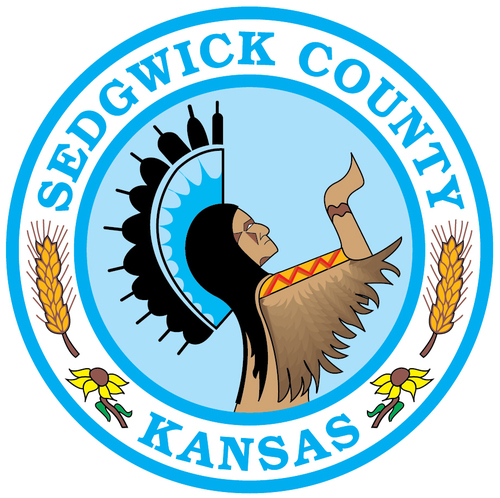 This attitude, however, disrespects the sacrifices of the people of Sedgwick County and its visitors to raise those funds. 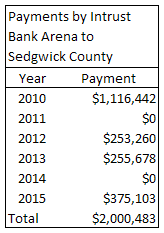 Any honest accounting or reckoning of the performance of Intrust Bank Arena must take depreciation into account. While Unruh is correct in that depreciation expense is not a cash expense that affects cash flow, it is an economic fact that can’t be ignored — except by politicians, apparently. When it comes to having good conditions to support small businesses, well, Wichita isn’t exactly at the top of the list, according to a new ranking from The Business Journals. Many in Wichita don’t want to recognize and confront the bad news about the performance of the Wichita-area economy. 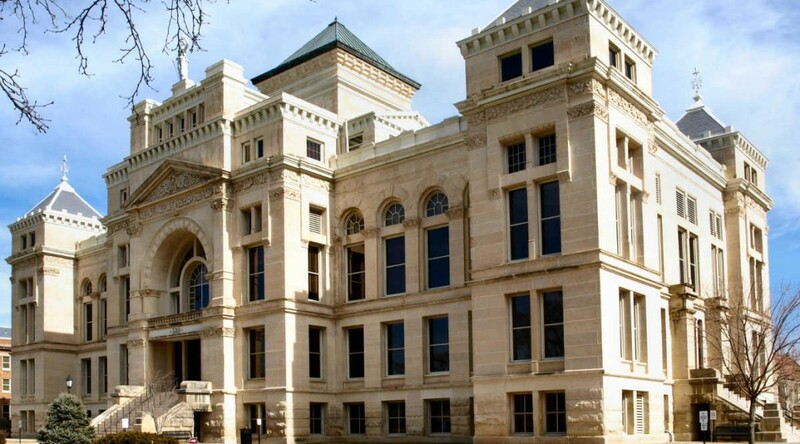 Last year, when presenting its annual report to local governmental bodies, the leaders of Visioneering Wichita would not present benchmark data to elected officials. 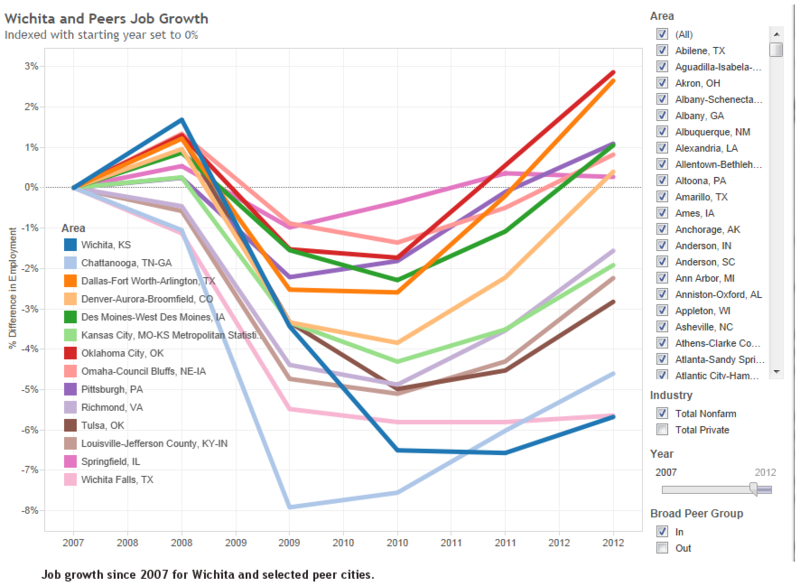 If we look at job creation starting in 1990, Wichita lags behind our Visioneering peers, but not behind all the peer cities that I selected. 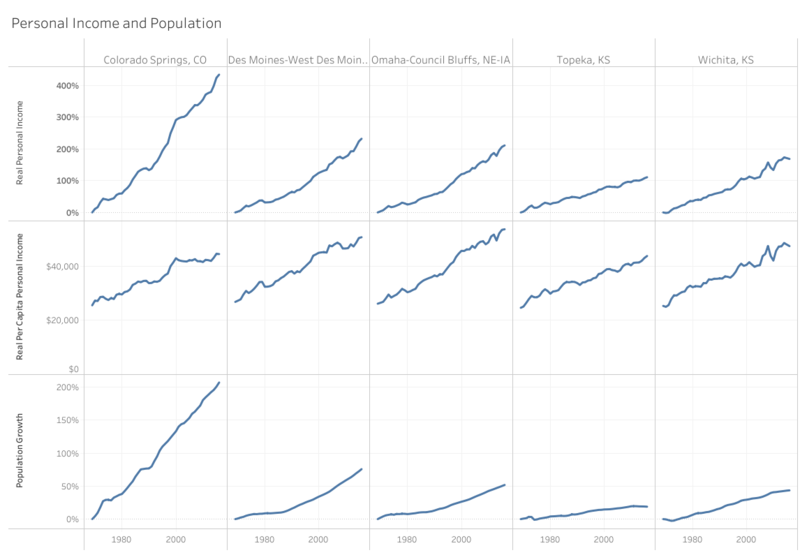 Wichita does better than Springfield, Illinois, for example. I chose to include that as a peer metropolitan area because that’s the immediate past city that Gary Plummer worked in. He was president of that city’s Chamber of Commerce, and is now president of the Wichita Chamber. Note the position of Springfield: Last place. In next-to-last place we see Wichita Falls, Texas. I chose to include it because it is the immediate past home of Tim Chase. 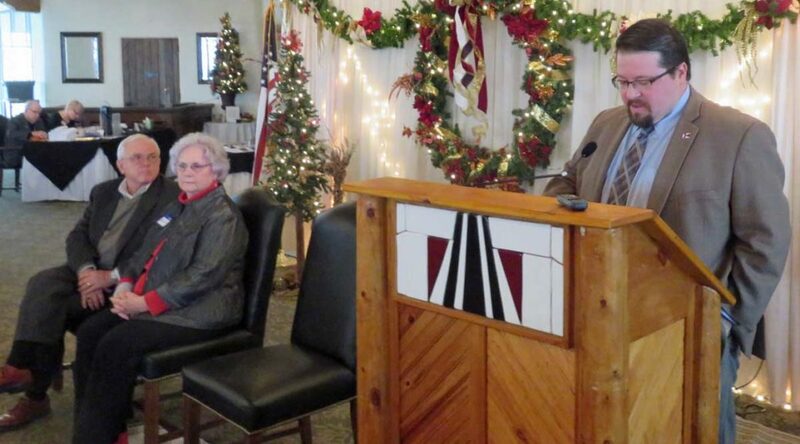 He was the head of Wichita Falls Economic Development Corporation. He’s now president of Greater Wichita Economic Development Coalition, the primary organization in charge of economic development for the Wichita area. In second-to-last place we see Pittsburgh, which I added because Visioneering leaders recently made a visit there. Then, we come to Wichita. 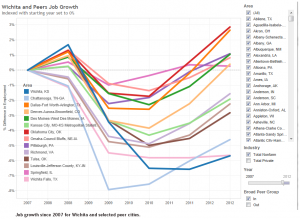 If we look at job creation since 2007 we find Wichita in a common position: Last place in job creation, and by a wide margin except for two cities. One is Wichita Falls, where our present GWEDC president recently worked. The other city that barely out-performs Wichita is Chattanooga, which I included because Visioneering civic leaders recently traveled there to learn from that city. 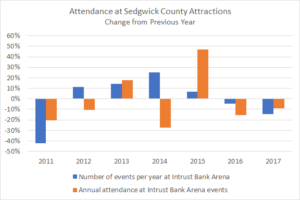 Over the decades in which Wichita has performed poorly, there have been a few common threads. Carl Brewer has been council member or mayor since 2001. Economic development director Allen Bell has been working for the city since 1992. City Attorney Gary Rebenstorf has served for decades. At Sedgwick County, manager William Buchanan has held that position for more than two decades. 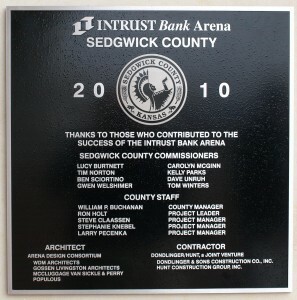 On the Sedgwick County Commission, Dave Unruh has been in office since 2003, and Tim Norton since 2001. It is these officials who have presided over the dismal record of Wichita. Wichita City Manager Robert Layton has had less time to influence the course of economic development in Wichita. But he’s becoming part of the legacy of Wichita’s efforts in economic development. These leaders often complain that Wichita does not have enough “tools in the toolbox” to compete with other cities in economic development. Wichita does, however, have and use incentives. 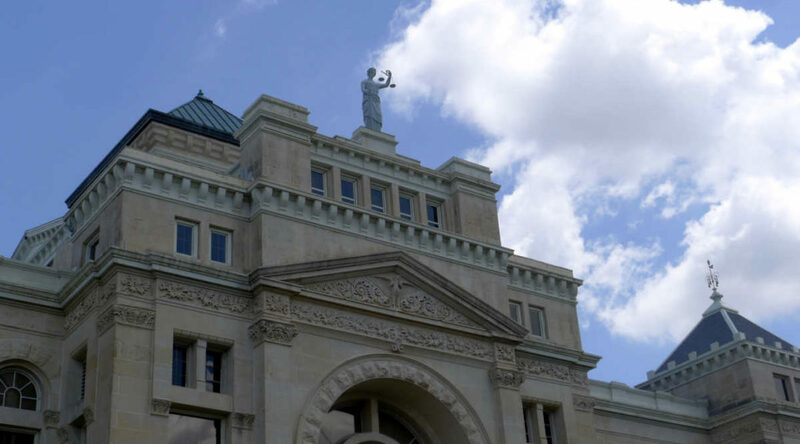 The State of Kansas regularly offers incentives so generous that Kansas business leaders told the governor that they value these incentives more than they would value elimination of the state corporate income tax. Incentives: We have them. They haven’t worked for us. It is nearly certain that this year Wichitans will be asked to approve a higher sales tax in order to pay for many things, including the more aggressive approach to job creation that Brewer mentioned. Based on the track record of our elected officials and bureaucrats, we need to do this: Before approving the tax and expenditures, Wichitans need to take a long look at the people who have been in charge, and ask what will be different going forward. 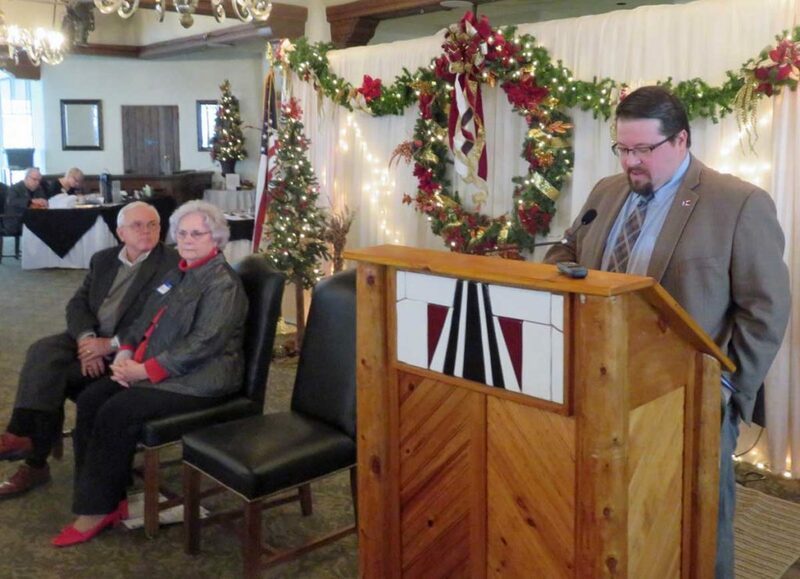 Wichita Chamber of Commerce: Why these panelists? Last week the Wichita Metro Chamber of Commerce conducted a panel discussion about economic development and job creation in Wichita. 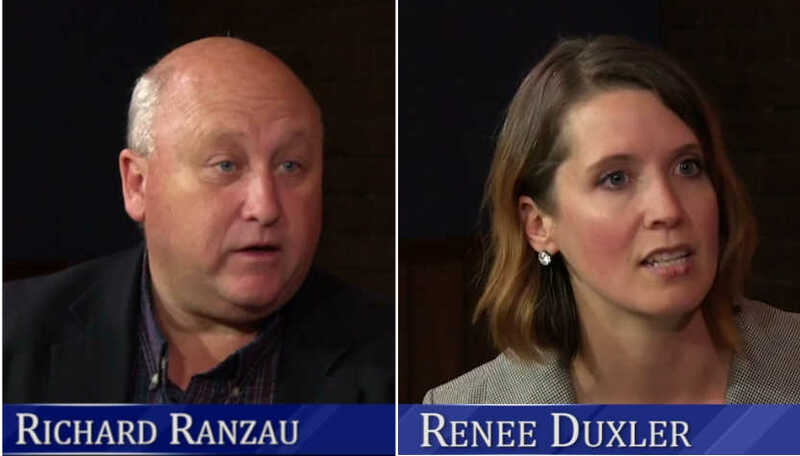 The experts selected as panelists tells us a lot about why the Wichita economy has suffered. 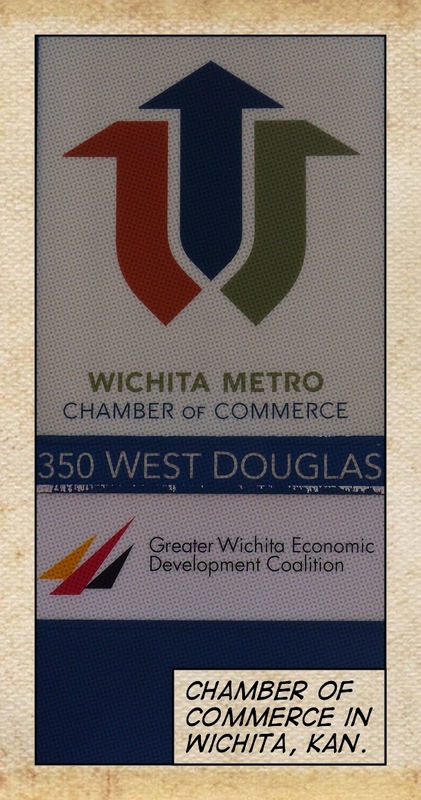 Wichita Chamber presentation. Click for larger version. 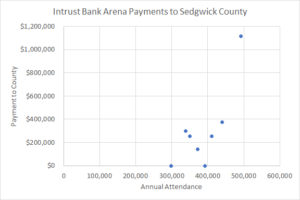 The news about the poor performance of Wichita in this regard is no surprise to readers of this site, although I’m not sure that those in charge, such as Wichita Mayor Carl Brewer, believe the numbers. Brewer, along with Dave Unruh and Chamber president Wayne Chambers were the three panelists on Wichita economic development. What is surprising is that Brewer and Unruh were selected as experts in this field, given the city’s poor performance and the tenure of these two leaders. Brewer has been mayor for nearly seven years, and has served on the city council 2001. Unruh has been in office since 2003, and has been chair of the commission several times, as he is currently. Imagine that. Our city’s longtime leader, as he enters the last year of his mayorality: Now he’s going to get serious about economic development, and will do so by relying on a citizen survey. 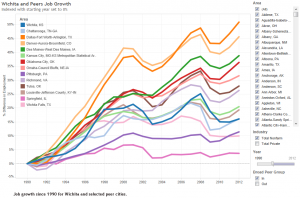 To use interactive visualizations that explore the Wichita economy, see Wichita’s growth in gross domestic product and For Wichita’s economic development machinery, failure. 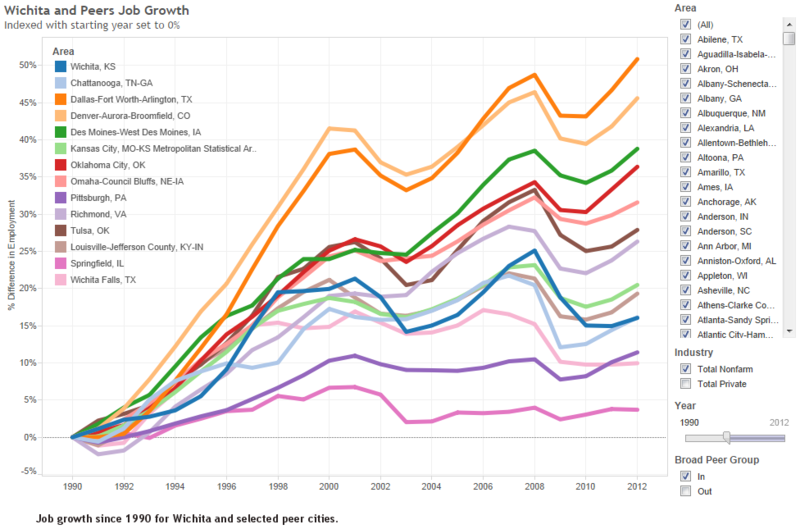 Compared to a broad group of peer metropolitan areas, Wichita performs very poorly. As Wichita embarks upon a new era of economic development, we need to ask who to trust with this important task. 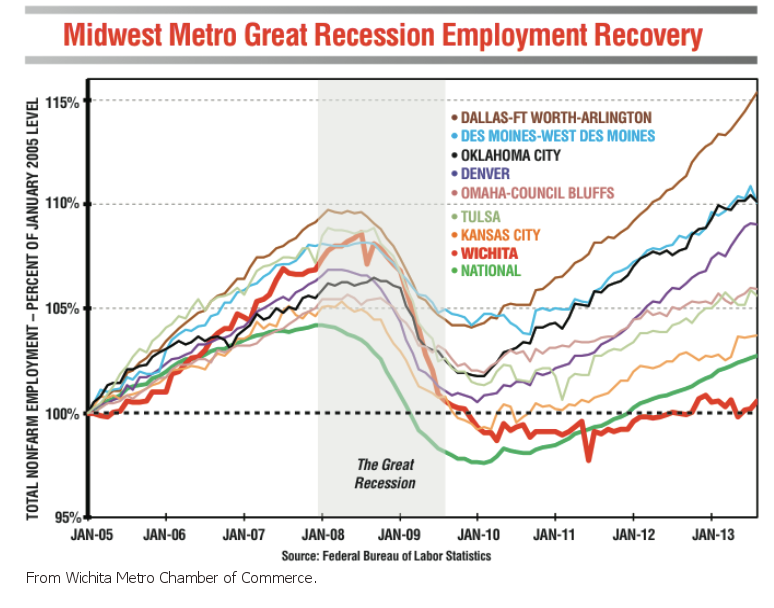 The bad news: Wichita has performed very poorly in job creation in recent decades, and even if we decide on a more aggressive approach, pretty much the same crew is in charge. 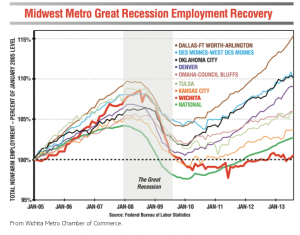 If we look at job creation since 2007, the year before Sorensen wrote his op-ed, we find Wichita in a common position: Last place in job creation, and by a wide margin except for two cities. One is Wichita Falls, where our present GWEDC president recently worked. The other city that barely out-performs Wichita is Chattanooga, which I included because Visioneering civic leaders recently traveled there to learn from that city. 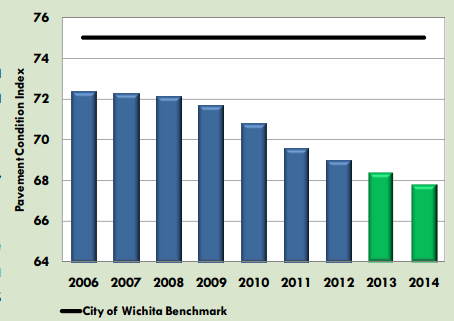 Over the decades in which Wichita has performed poorly, there have been a few common threads. Brewer has been council member or mayor since 2001. Economic development director Allen Bell has been working for the city since 1992. City Attorney Gary Rebenstorf has served for decades. At Sedgwick County, manager William Buchanan has held that position for more than two decades. 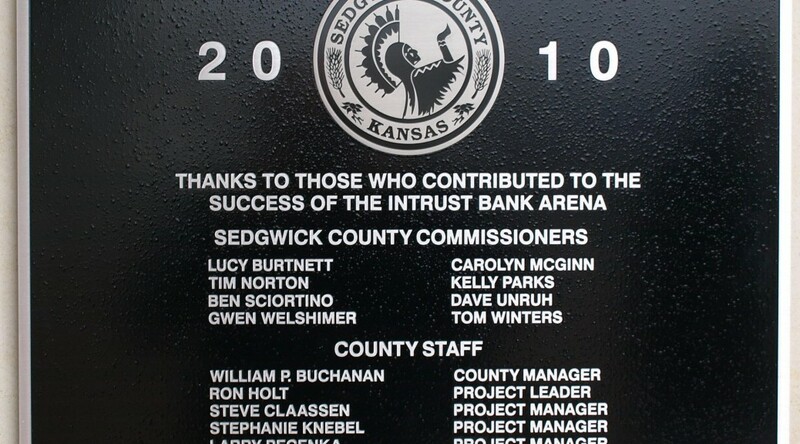 On the Sedgwick County Commission, Dave Unruh has been in office since 2003, and Tim Norton since 2001. 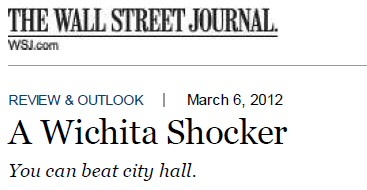 It is these officials who have presided over the dismal record of Wichita.